!! OMG, How Mysterious: Lost Hairpieces !! Where do all the lost and lonely wigs go? Hair extensions torn asunder and left to languish? I saw a ratty brown wig lying on the sidewalk on Third Avenue last week– near an apartment I once lived in– and for a moment was nearly paralyzed with sadness. I thought about picking it up and adopting it, but the person I was walking with said it would be gross, so we walked on, leaving it to its own devices. 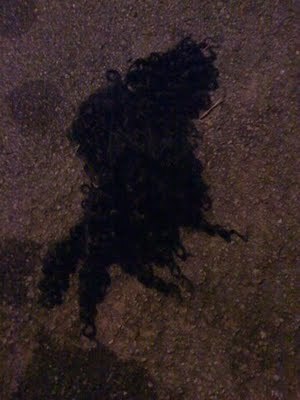 Luckily, a blog has come along to speak for the weaves: Gabe at Girl You Lost Your Weave is the Nan Goldin of abandoned hair, documenting in searingly honest photographs the hazy morning-afters of St. Louis, MO’s fake tresses. Weaves in the street; wigs in the gutter; a few mysterious locks in the grass. Where is all the fake hair coming from? Do its owners miss it? Do they even know it’s gone? » NEXT ENTRY: OMG, How Innocent! 2 Comments on "OMG, How Mysterious: Lost Hairpieces"
I think that’s a used merkin. You know OMGBlog is going down hill when they run a post on lost hair.